‘By Gendo Lucy Xiao Sometimes the opportunity to be helpful and make a difference in someone’s life falls into your lap—or perhaps your back alley. Here’s a recent story of how opportunity was met at City Center with the many hands of sangha.It was around 8 a.m. at Golden Gate Bridge. Having recently arrived from Wuhan, China, Jenny and her daughter Lee had begun a day of exploring the Bay Area with a visit to the famed bridge. While they were taking photos, thieves broke into their rental car and took their backpacks, which contained their passports as well as all of their money and bank cards. The two visitors spent the rest of the morning dealing with the police, the Chinese embassy and the banks, as the promise of a day of adventure turned into a jarring introduction to a relatively unknown country. Meanwhile, a backpack was discovered in the alley behind City Center by Mark O’Lone, one of the Zen Center volunteers, who turned it over to the front office. When resident and front office worker Eli Brown-Stevenson investigated the contents and found passports and other documents, he called the police and the Chinese embassy, trying to find the owner. After overcoming many obstacles, he finally got in touch with Jenny and Lee by email.By the time the women arrived at City Center at 4:30 p.m. that day, they had been without food and water all day because they had no money. Kyoshin Wendy Lewis opened the door, heard their story and understood their difficult situation. She contacted the guest manager, Reen Perkins, who arranged for them to stay in a room in the temple. Allison Tate, Eli’s co-worker in the front office, had kept the backpack safe until she could hand it over to Jenny and Lee, who were relieved to find that other than the cash (which was a disappointingly large amount), all their passports, IDs and bank cards were still in the backpack. At City Center, they were greeted by many friendly faces, received a hot temple meal and had a good night’s sleep. I met them over dinner and was able to speak with them in their native tongue. We had a pleasant chat and a tour of the building after dinner. 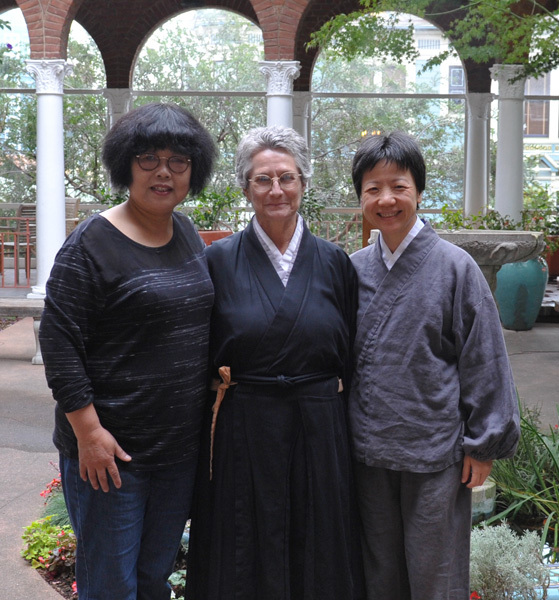 As I was showing them the zendo (meditation hall), they were impressed that we actually practice facing the wall, as most Chinese have heard the story of Bodhidharma sitting “facing the wall for nine years” after he arrived in China.The next morning before parting we took pictures together in the courtyard. “I’m quite tough, but now you all made me cry,” was what Jenny had to say as tears welled up in her eyes. 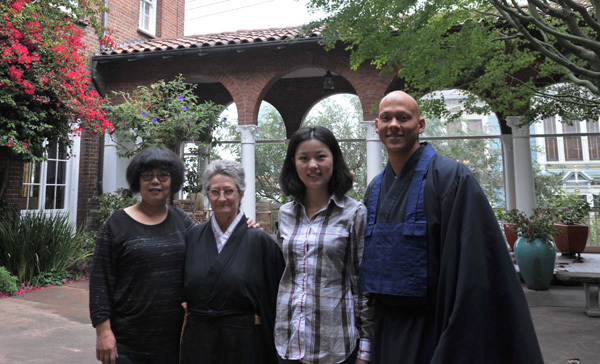 Our accidental visitors expressed how losing their belongings led them to discover Zen Center, or as they put it “this special place,” and to make wonderful connections with the people here. They said the experience inspired them to be kind to others.We agreed that our meeting under these unusual circumstances can only be explained by the Chinese term “shan yuan” (善缘), which means it is due to positive causes and conditions in our lives that we have been brought together.